Named after a famous peak in the Swiss Alps, the Eiger hiking boot is an innovative technical approach shoe that is the cornerstone for Wenger Swiss Army footwear lineup introduced in 2008. 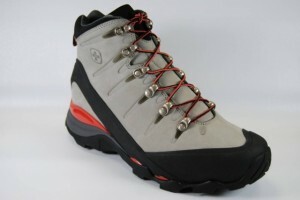 This is a boot that merits consideration as an all-around hiker you can place your confidence in. The Eiger is engineered with high-end technologies designed to provide comfort and traction on long hikes and alpine approaches. Eiger is constructed with a waterproof, yet breathable, membrane inner bootie. Both the insole and liner use anti-microbial and anti-bacterial technology that not only keeps foot odor in check, it helps prevent bacteria related foot ailments from affecting the feet on a long backpack or trek where you’re counting on one pair of boots the entire way. Another foot-saving technology Wenger has designed into the Eiger boot and each model in the Alps Collection (Shiltorn, Lotschen, Matterhorn and Interlaken: all named for Swiss peaks) is the Active Inertia System, a technology that displaces vibrations towards the outer edges of the shoe by redirecting impacts outward rather than upwards through your ankles, shins, legs, etc. Combine this with a multi-density outsole called Spyraflex System that protects the feet and absorbs and disperses impacts so common on a long hike. Furthermore, the Eiger boot uses a Temposit technology for the sole as the composite materials allows the sole to harden in cold weather and soften in warm conditions. These are some impressive characteristics in a boot, and we are eager to test them ourselves. The Eiger boot is available in cool grey(pictured above), dark brown, beige, and black for men. Women can choose from black and cool grey. Suggested retail price is: $170.00 .